From our warranty to our unparalleled customer service, we have built our business around helping yours succeed. Our manufacturing process is built on quality methods and materials, not cutting corners. We only use the most reliable, best performing components available. From top-tier LEDs selected with minimal color variations (typically a fraction of a bin) to automotive grade cables, we design our product to last longer and look better than any other LED sign product on the market. Through our state-of-the-art whole-sign calibration process, we ensure every digital billboard and XVS sign displays smoothly and brilliantly, without tiling or quilting. We are the only manufacturer who factory calibrates for both color and brightness. From superior weather and water resistance to strong, lightweight cabinets, our displays are designed to provide years of worry-free performance. 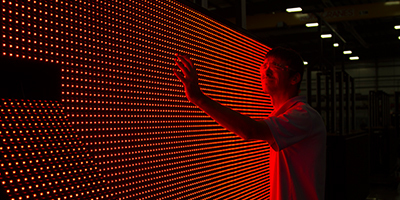 Both mechanically and electronically, our LED displays boast a streamlined design, low parts-count and simplified construction that minimizes maintenance and enhances reliability. These features give Watchfire products unparalleled field uptime. Our design is focused on uptime and reliability, featuring a patented multi-channel data configuration that helps keeps messages readable in the event of a service issue. We have engineered our displays to operate in all climates — from coastal regions with high humidity and salty sea air to desert areas with intense heat, high solar intensity and vast temperature changes. Before a Watchfire product goes to market, it must pass a battery of stringent tests for structural stability, windload, heat management, corrosion resistance and of course, water resistance. We design all our electrical components to withstand temperature cycling in our environmental chambers from -40°C to +60°C (-40°F to +140°F). We ensure that all our LED modules can withstand 1000 hours at 85°C (185°F) and 85% relative humidity. All modules pass the ASTM B117 salt fog test, which was originally designed to test corrosion resistance for automotive finishes. This process applies controlled thermal and mechanical stress to identify design weaknesses and avenues for product improvement. We perform a variety of electrical disturbance testing, such as EFT (electrical fast transient) and surge testing. For years, we’ve been proving the reliability of our modules by running them underwater for months at a time. Operating costs are an important, and often overlooked, consideration in choosing an electronic sign or billboard manufacturer. Watchfire uses only high efficiency components. The average energy usage of a Watchfire sign is about 1/3 of the maximum amperage requirement. Watchfire was also the first in the industry to be UL Energy Efficiency Verified.